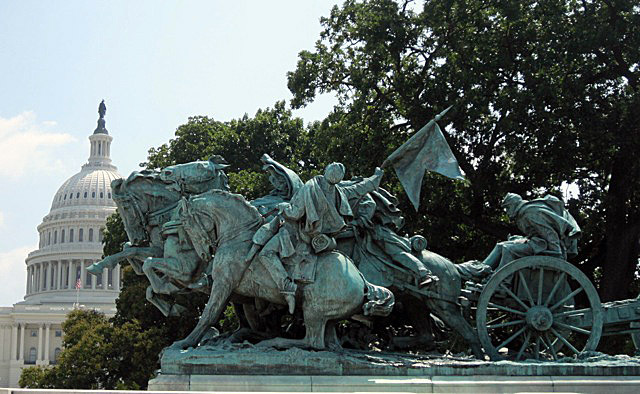 Henry Merwin Shrady (sculptor) and William Pearce Casey (architect), Ulysses S. Grant Memorial, 1901-1922, marble and bronze, 520 x 500 x 120 cm, Washington D.C. 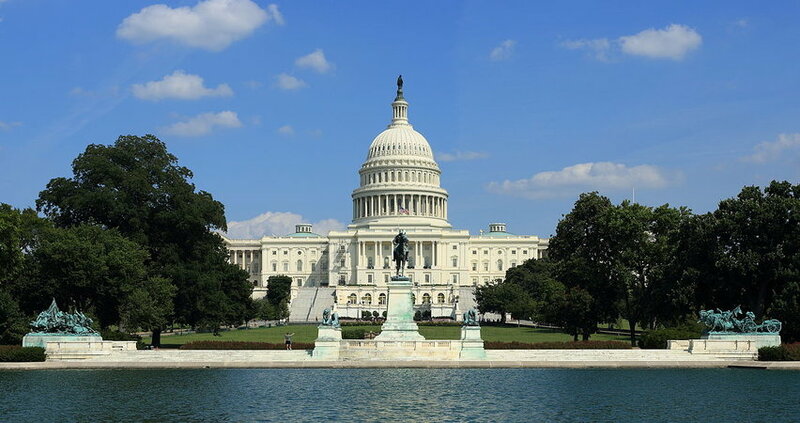 The dramatic and action-packed monument to Ulysses S. Grant in front of the U.S. Capitol Building, at once grand and intimate, speaks to both the valor and the horror of the Civil war. Henry Merwin Shrady’s massive tripartite memorial features a bronze equestrian statue of Grant on a central pedestal flanked by two sculptural groups of soldiers. Sited on top of a grand terrace 252 feet wide and 71 feet long, the memorial stands in front of a large reflecting pool built to complement the water feature in front of the Lincoln Memorial at the opposite end of the Mall. Grant, at the apex of the central column, calmly attends to the war around him. Silent, certain and yet not traditionally heroic, the figure appears weary, but determined, his uniform unadorned, his presence unassuming. 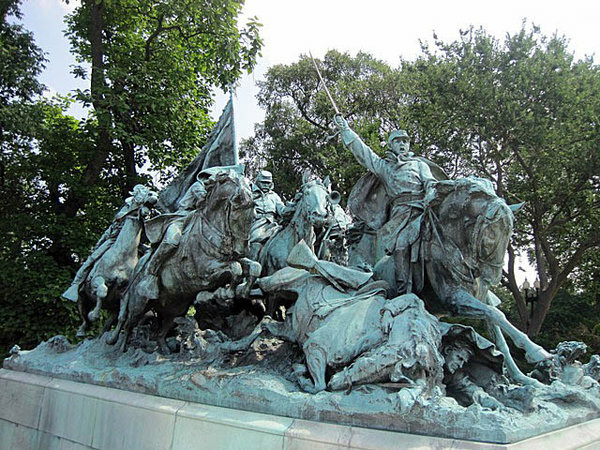 Henry Merwin Shrady (sculptor) and William Pearce Casey (architect), Cavalry Charge, 1916, marble and bronze, Washington D.C.
On Grant’s right is the seven men Cavalry Charge. Their commanding officer raises his sword and urges his men into battle. The horses leap into action as the bugler prepares to sound the charge. Yet this powerful and inspiring moment has already turned tragic. One of the horses has fallen and trapped his rider beneath. He is about to be trampled by the cavalryman behind who shields his eyes in horror. Shrady made himself the model for the fallen soldier by working from his reflection in a mirror, which proved prophetically poignant as Schrady gave his life to the monument’s completion. Henry Merwin Shrady (sculptor) and William Pearce Casey (architect), Artillery, 1912, marble and bronze, Washington D.C.
To the left of Grant is the equally dramatic portrayal Artillery. Three horses and five men bring forward a cannon but the bridal of the lead horse has broken. While the other two horses attempt to stop, the third plunges ahead causing the driver to lose control. The three riders appear both anxious and resigned as they brace themselves to be pitched to the side. Everything and everyone is destabilized. Even terrain under the cart is uneven and rutted. Both the Artillery and the Cavalry groups leave the visitor with narrative questions that will never be answered. 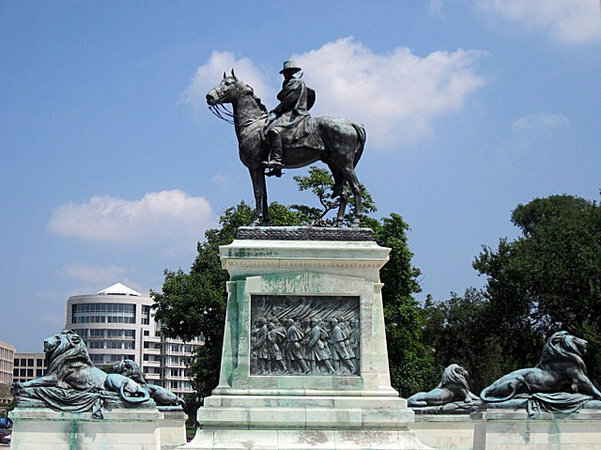 The monument’s origins go back to 1895, when The Society of the Army of the Tennessee proposed a memorial to Grant. Ulysses S. Grant was a two-term president, brilliant strategist ,and resolute commander in chief of all U.S. armies. He led the Union troops to victory time and time again, culminating in the surrender of General Robert E. Lee at Appomattox, Virginia in 1865. Henry Merwin Shrady (sculptor) and William Pearce Casey (architect), Ulysses S. Grant Memorial with the Washington Monument and Lincoln Memorial in the background, 1901-1922, marble and bronze, 520 x 500 x 120 cm, Washington D.C. In 1901, Congress authorized $250,000 for a memorial to the Grant Memorial Commission, the largest sculpture commission of the time. Sculptor Henry Merwin Shrady and architect Edward Pearce Casey won the design commission. Shrady immediately immersed himself in the details of Civil War battles. He joined the National Guard for four years to better understand military practice, borrowed Civil War uniforms, equipment and artillery, and convinced the military to run drills that would allow him to study the movements of soldiers and their horses. Shrady, taking great pains with every detail, pored over flags, uniforms, weapons, people, animals, and equipment to ensure they were accurately reproduced. The Grant Memorial Commission members, chaffing at the slow pace, pushed Shrady to work faster finally insisting he complete his work by the 100th anniversary of Grant’s birth. His health suffered under the strain. Two weeks before the memorial was dedicated, Shrady died. On April 27, 1922 the memorial was unveiled. Later that year, the Lincoln Memorial was completed and the Mall’s narrative was set. 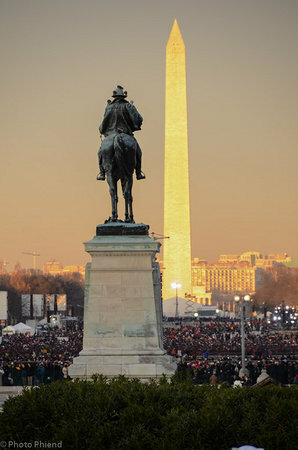 At the center, the Washington Memorial speaks to the founding of the country. On the far west end sits the great thinking man, Lincoln. On the other end of the mall the great man of action, Grant, sits astride his proud horse, Cinicinnatus. Together they succeeded in saving what Washington had established. Cite this page as: Julia Langley, "Shrady and Casey, Ulysses S. Grant Memorial," in Smarthistory, August 9, 2015, accessed April 20, 2019, https://smarthistory.org/shrady-and-casey-ulysses-s-grant-memorial/.